The Touhou series has, even without counting fangames, gone a whole lot of places. Starting as a series of bullet-hell shooters on the PC-98, Team Shanghai Alice and collaborators have created Touhou fighting games and versus shooters, changing gameplay with many installments. 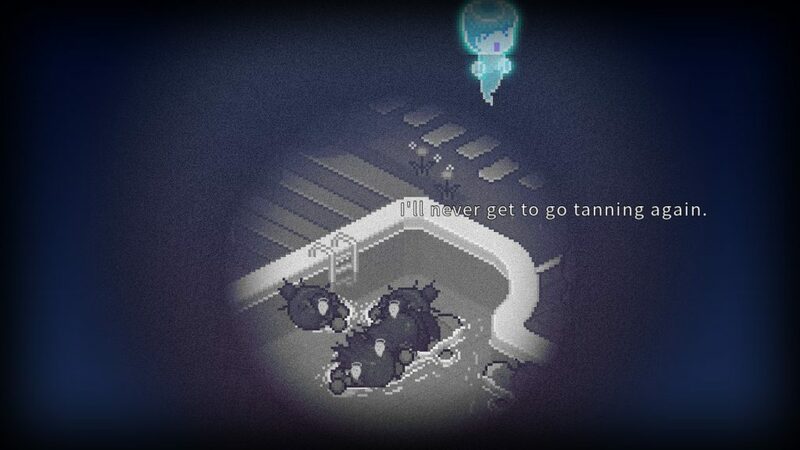 With fangames, there’s visual novels, metroidvanias, megaman style platformers, RPGS, and, with Scarlet Curiosity, a collaboration between Ananke Spa and Team Shanghai Alice, there’s ARPGs. All set in a world where it sometimes seems that morning greetings consist of an all-out battle with apocalyptic magic between cute anime girls, some of whom are also Youkai or other folkloric nonhumans. 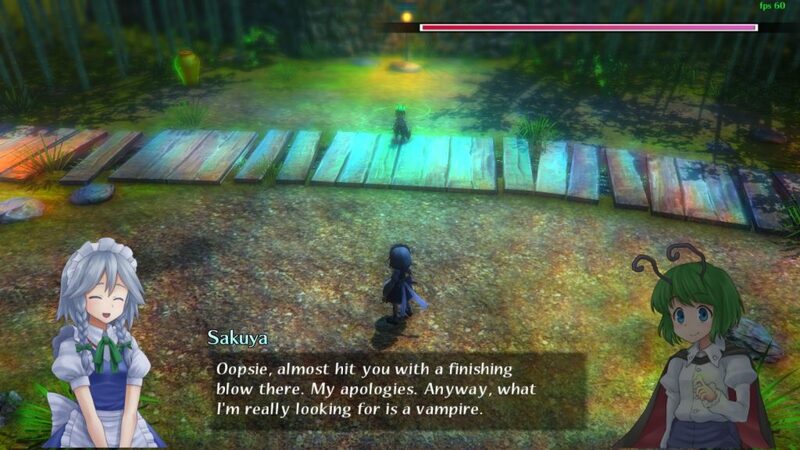 I mean… This might as well be called Touhou.JPG , for how emblematic this line of dialogue is. 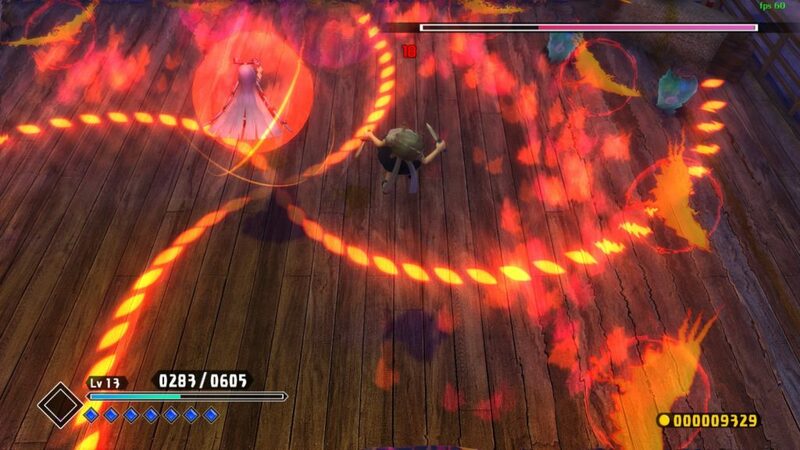 Scarlet Curiosity is an odd beast, in many respects, trying to mix action RPG ideas with the bullet-hell gameplay of the Touhou series with… Honestly, mixed results. This is also technically a Going Back, because while this is the 2018 Steam release, the game was originally created in 2014, and officially localised by XSEED in 2016. In any case, the general idea is that Remilia Scarlet, ancient and powerful vampire in the body of a young girl, is bored. Considering that she is, canonically, one of the more dangerous residents of Gensoukyo, this is already a recipe for disaster, but add in a Tengu tabloid monster hunt, and the fact that something largely destroys the Scarlet Devil Manor, and… Well, you have all the elements ready for shenanigans to occur. Takes a while to get going, though, to the point that, at first, I wondered whether this really was a Touhou game, bullet helling and all. Fairies were unaggressive, giant centipedes a case of slashing while circling… This, combined with the game having some large and sprawling maps, and a lack of visual feedback beyond numbers and hit sounds, disguised the fact that, in fact, I was struggling to get through levels. Come the second stage boss, and this lack of feedback revealed itself, as I died again, and again, and again, before finally respecting their patterns. It took until the fourth boss for me to stop thinking that the jump button in the game felt like an unfair advantage (Allowing the skilled… IE – Not me… To dodge most early game bullet patterns entirely. 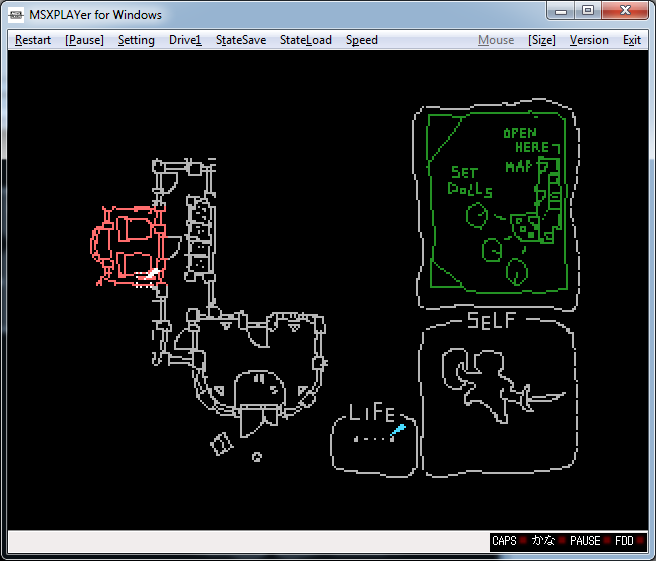 So… Large, sprawling maps (Each taking about twenty minutes to get through), combined with main level enemies that, like a Touhou shooter, don’t get terribly challenging until a little later on, combined with a lack of visual feedback for hits (and the fact that, like many bullet hell games, many bullet types can be nullified with an attack) doesn’t exactly paint the prettiest picture. In fact, it paints a somewhat clunky one. I will never take away, however, how spell card effects like this one look… Awesome. But there is good here. The models are well put together for the most part, the game does get flashy the further in you get, and the stages, while large and sprawling, are definitely not without their interesting features. 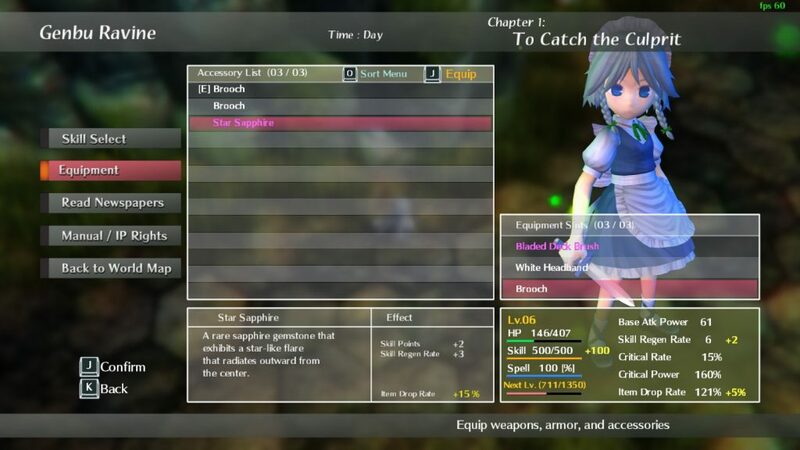 Loading and saving is separate for the two main characters, Remilia Scarlet and Sakuya Izayoi, which is a nice touch. Five slots each is generous, and I appreciate this. Similarly, in addition to each character getting different types of Weapons, Accessories, and Armour, following the usual ARPG rule of “Bigger numbers, always bigger numbers” , they also get to switch out their specials and skill cards for different types as they level up, leading to a fair amount of variety that I appreciate. Heck, there’s even some difference to their basic styles, with Sakuya being a tight, melee focused character, whose jump attack is just that: An attack in the air, and Remilia being a more loose, more aggressive character, who has a hard to master, but very satisfying ground dive as her aerial attack. Despite some light value issues making the lighter enemies hard to see well at times, the game visually works, and musically… Well, the Touhou games have always been known for good music, and Scarlet Curiosity is no exception. In the end, Scarlet Curiosity is an interesting addition to the series, but an acquired taste that is not without its flaws. Longtime Touhou players may find it slow to start, while folks new to the series may well find it frustrating, but I can definitely respect the experimentation with genre mixing going on here. Alas, pink on translucent grey is, as a colourblindness accessibility sidenote, not a good pick. 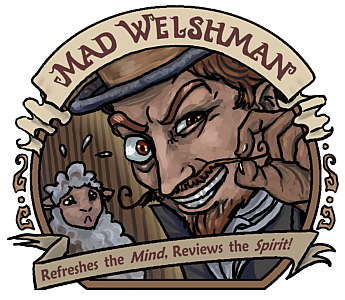 The Mad Welshman feels, apart from the whole “Being a dude” thing, that he would fit in well in Gensoukyo. I mean, Death Rays, Death Ray Spell Cards… What’s the real difference? So here we are, looking at a game where the main character, after having died, is employed by death to… Use various items around the levels to crush, burn, boil, freeze, and, generally speaking, make a lot of pixel people very, very dead. Death Coming is a good dictionary definition of “Guilty Pleasure”, considering its subject matter. Yup. Pushing tourists into toxic goop by means of plant is one of those “Guilty Pleasure” things. But y’know what? It’s fun, and I’m somehow shocked I missed this one back in November of last year. Ah well, let’s take a look now. 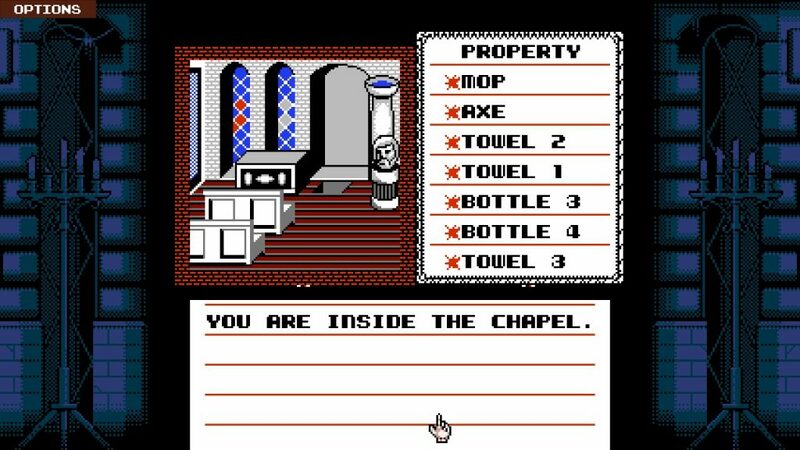 As noted, the basic gameplay idea is very simple: You have a town, and a certain number of items around town are imbued with the power of death. What this amounts to is that, when clicked for the first time, they (mostly) show you roughly what they’re going to kill, and, the second time around, they activate (With some later additions like guards who stop things going awry, and more complex, multipart death traps.) Aided with this knowledge, two goals are in sight: Kill a certain number of people (Who Death informs you have lived past their time), and kill three specific people in each level, because they, apparently, are both past their time and linked, in some fashion, to your own death. 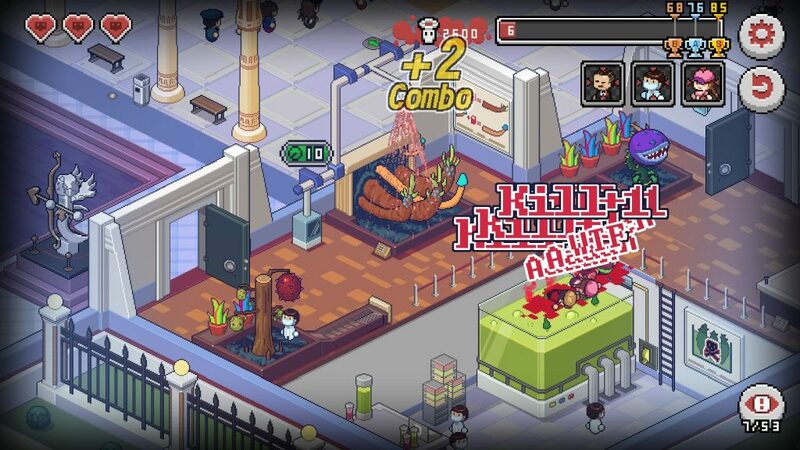 Aesthetically, the game’s isometric, pixel artwork and ominous tunes give a good backdrop to this strategy game of mass murder, with a whole host of animations that only gets bigger as the varieties of death get stranger and stranger. 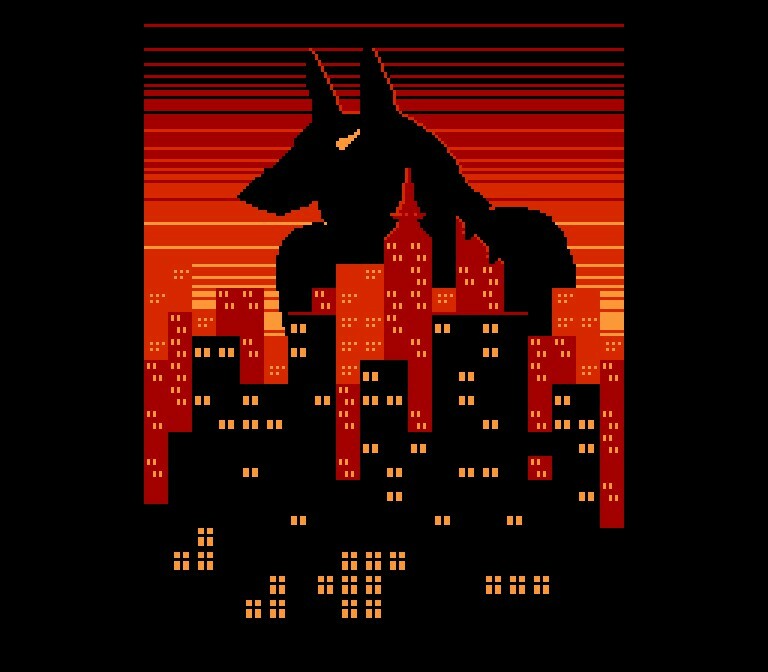 Here, the manhole cover is opened, and there’s just a frame of suspension, before the fall into darkness, a meaty crunch, and an FPS style announcer deeply intoning “MEGAKILL.” This is not a game trying to step around its subject matter. Some folks, apparently, need to die more than others. At least some of these can be related to the level’s narrative. The game does a fairly good job of adding to its replayability, with each area having a new wrinkle, unique feature, or extra step in difficulty (such as the introduction of changes due to different weather conditions. Dagnabbit, I missed my 3 minute window to use a manhole!) , and this leads me to the two niggles I have with this game: That it’s somewhat short (Delightful, but short), and that it has a single save system. Otherwise, Death Coming is an interesting take on hidden object puzzle gameplay, with a solid focus around its theme, some black comedy, and good replayability. Worth a look. Every level adding something new, some new wrinkle. Today’s wrinkle? Weather, part the second! The Mad Welshman doesn’t have a lot more to say. The game kind of speaks for itself. At first, I was, I’ll admit, a little confused over being asked to review TAROTICA VOO DOO, even as an advocate of old games, and the joy (and pain) of programming for older systems as a good thing to do. It’s not the friendliest of games. It’s not the easiest of games. 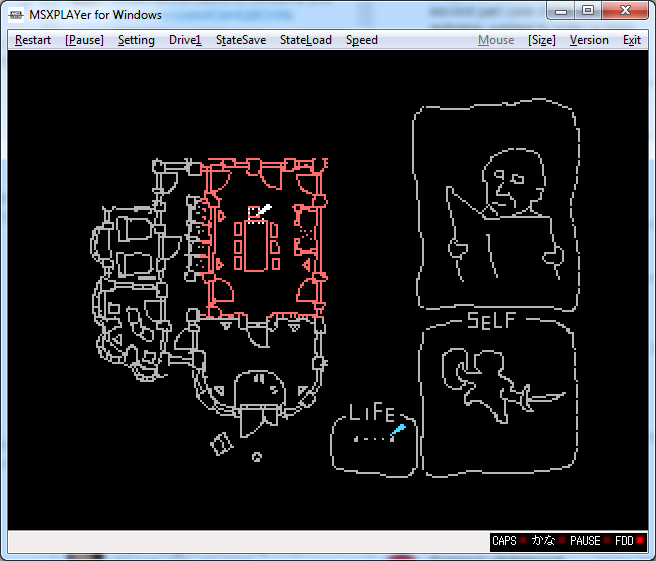 It definitely has its flaws, and, even as someone who likes a lo-fi aesthetic, 2-bit “hand drawn” (read: Pixel doodles) wasn’t immediately endearing to me. One of our three family members, completely ignoring us because dinner’s not on the table… Ohhhh, I hope a pla- ah wait, that’s exactly what I hope to prevent! Tarotica Voo Doo is a somewhat surreal “Escape Room” game, in which you solve puzzles (Some of which spread over the entire house, like the Salamanders who light up rooms), in order to break into a family’s home, cook them dinner as an apology, and get them out of the house, all before a plane crashes into it. It’s also a game coded for the MSX. Not the MSX 2, or 3, or Turbo. 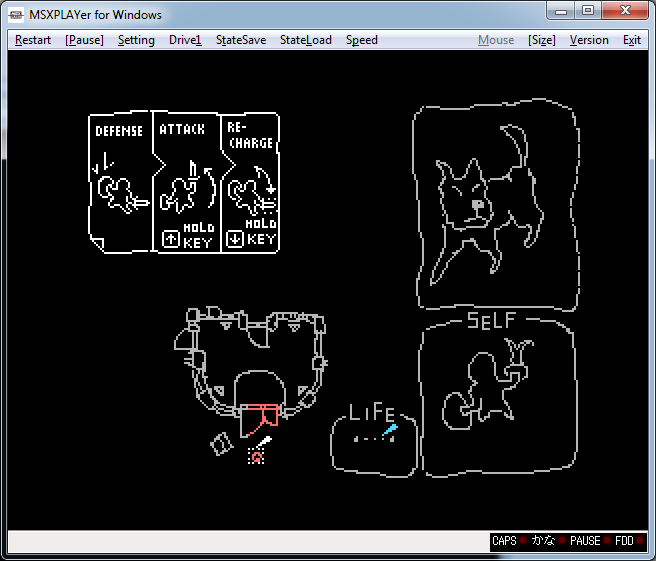 The MSX, played via the official MSX emulator. 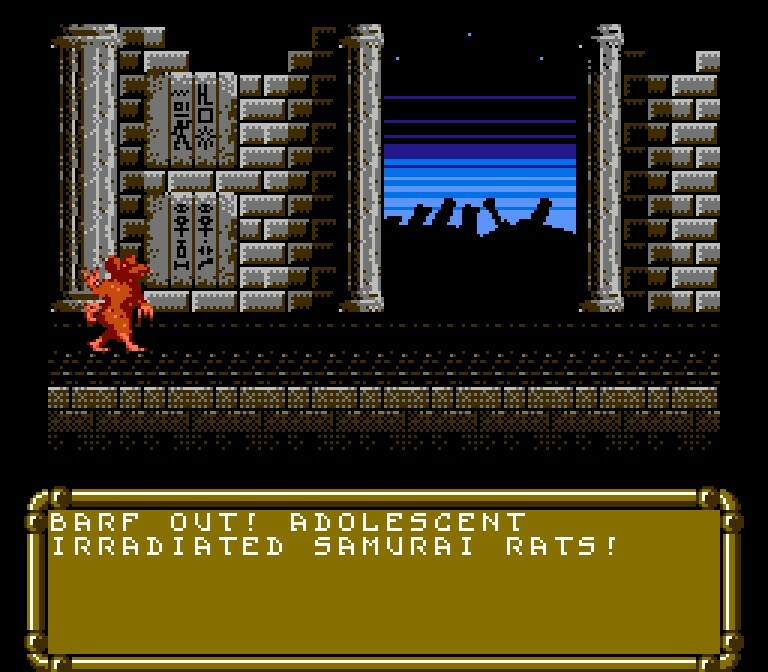 So… A game coded for a 1980s platform, in 2018. Normally, very much my jam. As to the game? Well, it mostly comes out middling. I like, for example, how four frames of animation are used to good effect in puzzles and combat alike, with the latter a sort of rhythm deal where you have to time pulling fully back (for defending) and forward (for attacking) carefully, with the only pressure being that failure means restarting the (short) fight. I like how smoothly the developer has papered over the cracks of a slow Video RAM, meaning that the experience doesn’t jerk or stutter, even in the short, equally 2-bit cutscenes. I like how its control scheme (arrow keys to move, space to start interacting with a highlighted object, up and down to interact with it, space again to leave that interaction) is simple, and similarly smooth. I’m not so fond, however, of some of the more house-spanning puzzles, like going back between various rooms and the basement, in order to release the salamanders that provide light for the torches… Or block them off. A few fights (such as with one of the aforementioned salamanders) are just a tadge counter-intuitive, and, as mentioned, despite liking lo-fi aesthetics, Tarotica Voo Doo’s didn’t really grab me. Nonetheless, it’s not a bad couple of hours, even if it didn’t quite grab me, and, with the attached “CHRONICLES OF TAROTICA VOO DOO”, detailing how the program was built up, it’s an alright, actually retro game with a post-mortem dissection of how it was put together that’s well worth a look for 8-bit programming enthusiasts, or even folks who just want an idea of why pushing the limits of an older machine was hard as hell. This puzzle’s explanation is one thing, practice another. Thankfully, with only four frames per statue, it’s easy enough to work out. The Mad Welshman is heartened by the fact that, even today, people struggle with assembler. It puts his own struggles in perspective. Okay, so I’ve uncovered this… But how the heck do I open this door to the left? HRM. Why all this preamble? To establish two things. That the adventures comprising this remake anthology are not, strictly speaking, firsts in the genre. Influential games, yes, but not firsts. But also that it’s fascinating to see changes and shifts, not just on the purely international level, but within individual nations. We’ll be briefly coming back to this, but first, the games! 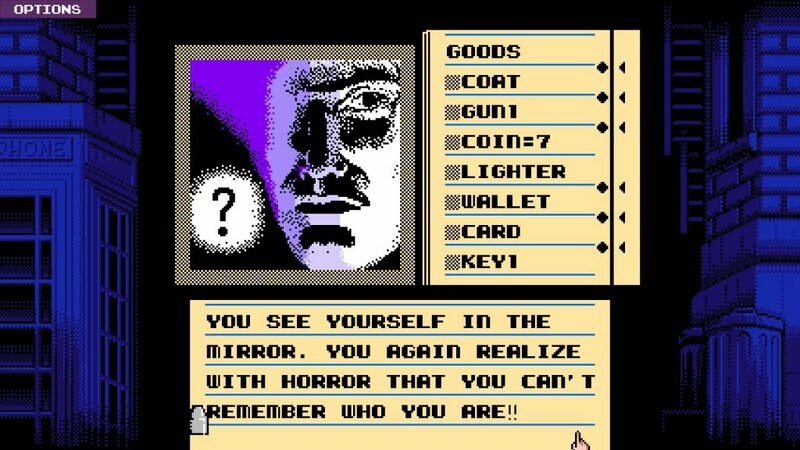 The three games that comprise this trilogy were originally created in the mid 80s (1985-87) for the then humble Apple Macintosh, and, as such, were known as the MacVentures: Deja Vu, a noirish tale about an amnesiac detective down on his luck; Uninvited, a haunted house tale with the main character searching for their younger brother; and Shadowgate, a fantasy yarn that, despite the comparatively higher difficulty of the former two games, has a reputation for its gotchas and deathtraps. They had a graphic user interface, a selectable parser, and an icon based inventory, all of which were not, strictly speaking, new… But they might as well have been to the European and American audiences. They did pretty well, well enough that a company called KEMCO ported them, with permission, to the Nintendo Entertainment System in 1989 and 1990. These are the games remade and presented in this anthology, and this, also, is interesting because the UI was changed, a controller led pointer was introduced (as in Project Mephius, several years previously), and Nintendo, a family friendly company even then, asked for… Changes. Some of these changes, I’m sure people are very grateful about: As far as I’m aware, the ten minute timer for one of Deja Vu’s “Solve this or die” puzzles (finding a cure for your amnesia) was gone. Yes, ten real time minutes. The interface was made tighter due to platform limitations, pentagrams were replaced by stars, and crosses by chalices, and, in an odd decision, it’s not the younger brother you save in Uninvited, but an elder sister. Yep. That is indeed a greenscreen terminal filter. Yessirree. 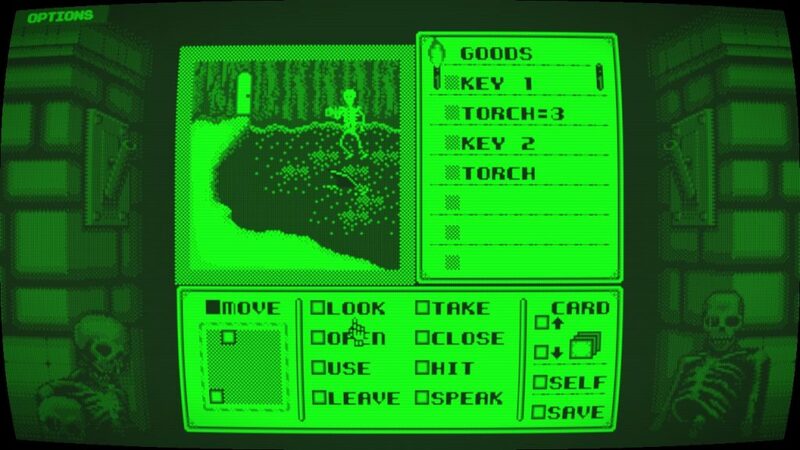 In any case, that’s where we are today: Reviewing a port of a port of a trio of adventure games from the 80s. How do they hold up? Not that bad, actually! The Nintendo versions were not only notable for their changes, but a solid soundtrack that still holds up to this day, distinctive spritework, and an interface that, thanks to the fact we’re using a mouse rather than the NES controller, is highly accessible and a delight to use. Each could be played through over the course of an afternoon, perhaps less if you follow the ancient adventure game maxim of “Save Early, Save Often” , and only a few of the puzzles don’t have some signposting to their solution (There’s no clue, for example, that a certain ghost is afraid of spiders, sadly.) Be warned, however, that garbage items with no actual use in game abound. 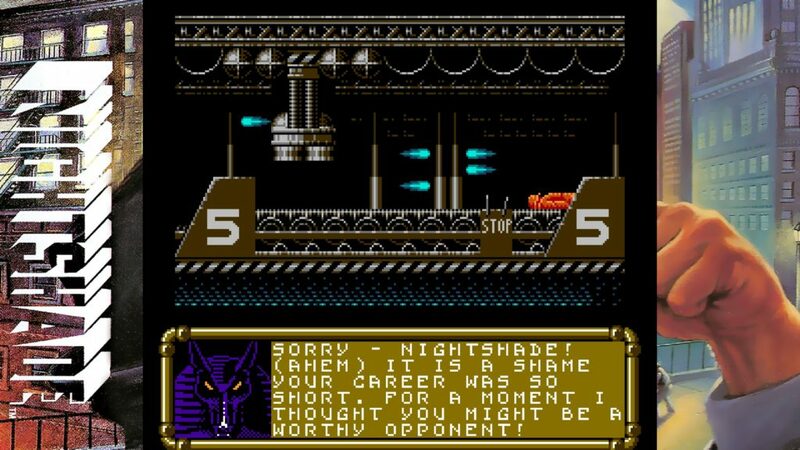 Old adventure games loved to do that, partly for realism’s sake (Yes, even then), but also partly to obscure solutions. Being able to keep saves, and switch between them with relative ease? Oh yes, this is good. Having… Old monitor filters? Well, I guess it’s there? (Not gonna lie, if I wanted more eye strain, I’d just dig out my old BBC Micro and its CRT monitor. But they are nice filters.) And the writing of the games, for the most part, holds up. Deja Vu, being both a game of the 80s, and being inspired by the pulps, is perhaps the one that has aged most poorly, but there’s still some solid design there. Also, the achievements. Ah ha ha yes, the achievements! It somewhat tickles me that the achievements for this trilogy all have to do with something you would either, unaware of this game from its heyday, stumble into, or, if you’re like me, a person amused by the death states of old videogames, actively seek them out: The deaths. Wait, you mean that lady wasn’t friendly? Gosh! And my shield could only take a few puffs of molten, superheated death spewing from a dragon’s mouth? Golly! Well, we know we’re a dude. This much, we can be sure of. As pieces of relatively faithfully preserved games history, this isn’t bad at all, although the “Volume 1” confuses me a little. After all, there were four MacVentures in total, so… Where would you go from here, General Arcade and Abstraction? Although it must be said, this trilogy did seem to inspire a wave of graphical adventure innovation in the West, from the Legend Entertainment games, to the Magnetic Scrolls series, each of which contributed, somewhat, to the eventual rise of the point-and-clicks we know and love today. The Mad Welshman enjoys older adventure games. Things tend to happen when he BITE LIP, however. Terrible things.